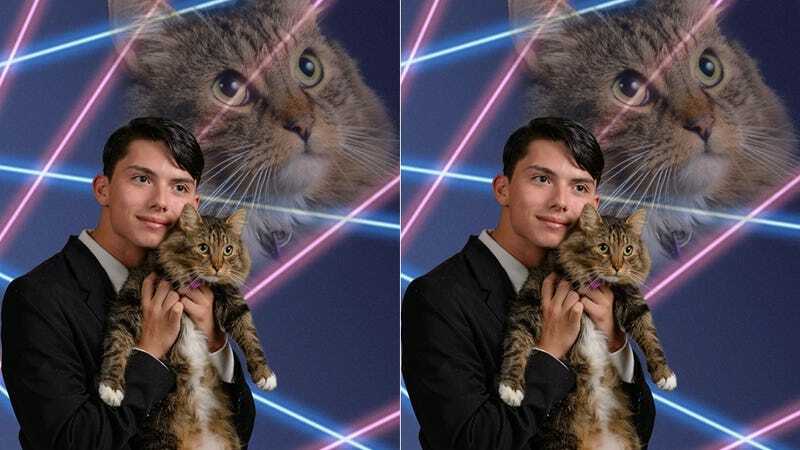 Schenectady High school senior Draven Rodriguez is a humble teen with a single humble request: to feature as his yearbook senior portrait a photo of him cuddling a big, fluffy cat in front of a laser background. Let's help him. Local news reports that the school has informed Rodriguez that he can submit the photo to be featured in the yearbook, but it can't be used as his official senior portrait. But the petition Rodriguez started to support his cause states that the school hasn't yet said no to the "cat-tastic" portrait (taken by Vincent Giordano) and the petition is a pre-emptive strike that he hopes will strengthen his case. As a former teen who had a cat feature prominently in one of her senior portraits, I could not be any more pro-this. Let's make this happen.